Obtaining a Commercial Driver’s License, or CDL, is a mandatory requirement for many jobs that involving handling large vehicles on the roads of America, such as school bus driver, limousine driver, tractor trailer driver, chartered bus driver, delivery driver, etc. Because these jobs involve a lot of responsibility, often including the lives of many people, several years ago the government instituted the CDL program, which tightened up the minimum standards a person must meet before getting approval to drive large commercial vehicles. To obtain a CDL, you’ll need to pass a rigorous two part test-the road CDL test, in which you take a truck out on the road and demonstrate that you’re capable of operating and maneuvering it safely, and a written test, which many people find even more difficult than the actual driving portion. The cost of taking the CDL test varies from state to state, and you’ll want to check with your Department of Motor Vehicles for the details, and to arrange for taking the test. But in most states, you’ll have to provide your own truck, which you can usually rent if necessary. In addition to the written test for the basic CDL test, there are also several other tests you may be required to take, depending on your circumstances. There’s the HazMat certification, which you’ll want to take if you want to be able to pull containers of hazardous materials. In order to be licensed to drive a truck with air brakes, you’ll need to pass a separate air brakes test. There are other tests for pulling double and triple trailers, carrying more than a handful of passengers, hauling gasoline and similar substances. All these tests are difficult to pass, as they should be, since we don’t want unqualified people driving school buses or transporting dangerous materials. To qualify for your CDL, you’ll need to put in some long hours hitting the books with some good CDL preparation materials. 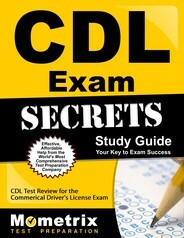 Ace the CDL test using our CDL exam study guide with practice questions. 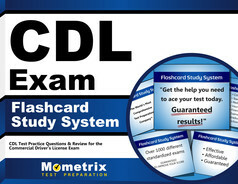 Quickly Solve Difficult CDL Test Questions with the CDL Flashcard Study System.